Note to editors: To view the photo associated with this press release, please visit the following link: http://media3.marketwire.com/docs/BT_20160218_RCS_Success_in_PL_Level_Crossings.jpg. Rail technology leader Bombardier Transportation has further boosted its market leading mainline project portfolio in Poland with the recent completion of two major rail control projects as well as the extension of a rail signalling maintenance agreement. In December 2015, the BOMBARDIER INTERFLO 200 rail control solution entered service on the Warsaw Zachodnia - Skierniewice section of the Warsaw - Lódz mainline, one of central Poland's high capacity connections. The project was delivered with minimum disruption to existing operations, with over 440 trains passing daily through the busiest point at Warsaw Wlochy. This installation included the set-up of an integrated control room equipped with the BOMBARDIER EBI Screen 300 central traffic control system at the Grodzisk Mazowiecki station, completed in a record three months. The system also introduced Bombardier's latest generation EBI Switch 2000 point machine, manufactured in Poland. The technology provides increased suitability for high speed lines, protection against extreme weather conditions, and a modular structure for easier maintenance and unit replacement. In addition, another highly demanding project was completed in December 2015 when Bombardier equipped a total of 92 EBI Gate level crossing systems across seven Polish provinces, as part of a network-wide upgrade. The upgrade projects required activities ranging from civil, track and signalling to power supply and telecommunication engineering works. 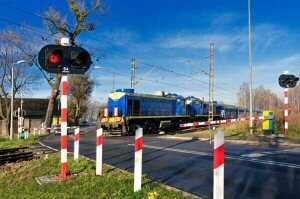 Delivered in consortium with Krakowskie Zaklady Automatyki S.A. (KZA Krakow), the delivery, installation, testing and commissioning of this high number of level crossing systems was completed according to a demanding timetable. Six of the 92 level crossings were located on the high priority lines prepared to operate Poland's new high speed trains, a process which required a major reorganisation of installation schedules to ensure on-time delivery. Bombardier has also been a key supplier of products and spare parts for maintenance for its rail control technology installed on the entire PKP/PLK Railway Network since 2008. A current agreement recently extended through to 2019, covers spares for a full range of Bombardier products including relays, point machine, train detection signalling, level crossing and computer-based interlocking systems. Bombardier Transportation has 90 years of experience in providing the latest signalling technology to the Polish rail network, and has provided rail control systems on all main rail lines as well as two Warsaw metro lines. In 2015, Bombardier's INTERFLO 450 technology became the first European Rail Traffic Management System (ERTMS) Level 2 to start operation in Poland. BOMBARDIER, INTERFLO, EBI and The Evolution of Mobility are trademarks of Bombardier Inc. or its subsidiaries.